Muslim, Catholic, Protestant, Buddhist, Hindu, Confucian, and Taoists leaders join high-ranking government officials to reiterate that Indonesia "will not give in to the threat of terrorism." For Defence minister, "Every religion teaches the fundamental principle of love,” whilst “Every act of terror goes against the true values ​​of every faith and for this reason we reject them." The death toll rises to eight. The authorities have 12 suspects under arrest. Jakarta (AsiaNews) – Four days after central Jakarta was attacked, 10,000 people rallied in Lapangan Banteng (Banteng Field), a historic site in the Indonesian capital, to show that the country is peace loving and tolerant and that it "will not give in to threat of terrorism." Organised by Nahdlatul Ulama (NU), the country’s largest Islamic movement, the interfaith event had already been scheduled some ten days ago. Catholics, Protestants, Confucians, Hindus, Buddhists and Taoists had confirmed their participation, together with top raking government officials and representatives of civil society groups. Defence Minister Ryamizard Ryacudu, Religious Affairs Minister Lukman Hakim Saifudin, NU leaders and representatives of many other interfaith organisations were in the front row. 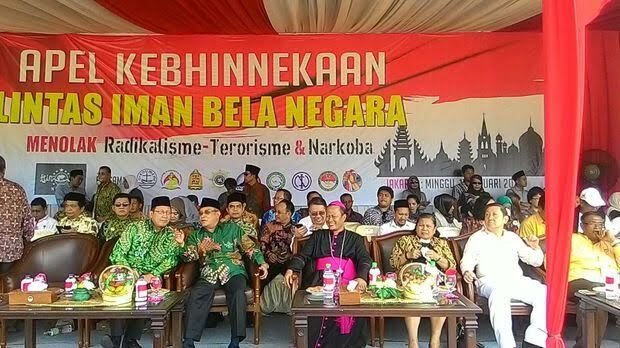 The Indonesian Bishops' Conference sent Mgr Yohanes Harun Yuwono, bishop of Tanjung Karang and president of the Commission for Interreligious Dialogue. "Every religion teaches the fundamental principle of love,” said former General Ryamizard Ryacudu. Religions “invite their followers to love one another. Whether Indonesia develops or collapses, this depends on us, not on others. Every act of terror goes against the true values ​​of every faith and for this reason we reject them." The Defence minister urged the thousands of people present to reinforce their patriotic spirit, because "terror and radicalism are our common enemy." Speaking to AsiaNews, Mgr Yohanes Harun Yuwono expressed his joy for the gathering in Jakarta, hopeful that similar events can occur in other cities. "I appreciate the initiative,” he said. “I really hope that those who want to strengthen Indonesia’s pluralistic spirit will be able to say so to those not present in the square." For their part, Indonesian authorities continue to hunt down terrorists linked to the Islamic State responsible for the attacks on 14 January. So far, police have 12 suspects in custody. Meanwhile, the death toll has reached eight (four civilians and four terrorists) after one of the wounded died in hospital. One of the dead, initially treated as the fifth, unidentified, terrorist, has now been identified as a civilian victim. During the demonstration in the square, Indonesia’s Defence minister said that it is every Indonesian’s duty to cherish the principle of Pancasila. * Restoring the nation is part of an “unconventional war”, the minister added, a war between religious ideologies that threaten to divide it.